Without a clutch glazing, drivetrain straining, hard launch an STI achieves achieves 5-60 mph in 6.6 seconds. So in your words the STI is a turd in real world driving conditions. I agree, its a gigantic turd! Dude, I'm 29. Unless your still asking your parents for permission to sleep over at a friends house, we're probably close to the same age. Time as the accord v6, maybe slightly slower. You sort of need to get a grip on reality and realize where this car is positioned, target demographics, and competitors. If you can't figure that out then the discussion is pointless. I bought an f150 last month, does that count? Also, no wife. No wife, happy life. Lastly, I'm not dead inside. I just simply don't have interest in 4 cylinder turbo cars anymore. My interest have become more expensive and grown if we're looking at "fast" cars. With that said, give me something comfy, automatic, and decent acceleration for my daily driver. Last edited by godfather2112; 06-08-2017 at 09:06 PM. comfortable competent hatch back that will do 5.4 to 60 if that matters to you. Loads of room and it will eat up miles like an anemic pac man. That is a great car. Will definitely look into one when my audi lease is up. i'd prefer they put the display screen even lower ... maybe on the floor. The stylish successor to the Volkwsagen CC arrived stateside Thursday at the 2018 Chicago Auto Show. The 2019 Volkswagen Arteon will go on sale in the fall and replace the CC that's aging quickly from VW lots. The Arteon benefits from economy of scale, notably scalable architecture that underpins the Jetta, Golf, Atlas—even Audi's TT. The Arteon adds more than five inches between the wheels compared to the CC, and pushes its wheels closer to the corners for a sportier shape. While identifiable as a Volkswagen, the Arteon strays from the CC's shape with angular details around the sides and a clamshell hood that wipes shunt lines from the hood, similar to the Audi A5 Sportback. The similarities with Audi's four-door coupe don't end there: the A5 and Arteon share nearly identical wheelbases (111.2 and 111.9 inches) and their overall mass should be nearly the same at more than 3,700 pounds in base configuration. Under its hood is a standard 2.0-liter turbo-4 that spins out 268 horsepower, which is 34 percent more power than the outgoing CC, mated to an 8-speed standard automatic. 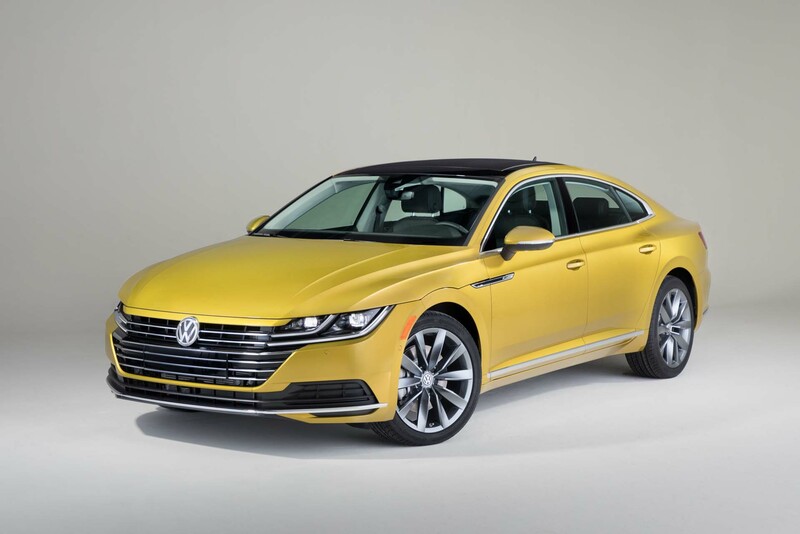 Other versions sold around the world can be equipped with VW's 7-speed dual-clutch automatic, but the 8-speed in the U.S. speaks to the Arteon's efficiency mission (for now) and VW's stated intention to make the Arteon a grand tourer and not a performance fastback. Available all-wheel drive will undoubtedly help the Arteon carve a tighter line around corners, and standard adaptive dampers should make the most of its running gear. An R-based performance version may be in the works, but VW execs are staying quiet for now. With more space between the wheels, the Arteon should be exponentially more comfortable than the CC, which lacked rear seat room—particularly head space. Volkswagen said the Arteon will be equipped with 18-inch wheels as standard, with 19-inchers available in top trims. Inside, standard synthetic leather and dials give way to nappa hides and VW's digital instrument cluster in top trims. Volkswagen hasn't yet announced pricing for the Arteon in the U.S., but it's likely to start in the mid-$30,000s. For more coverage of the 2018 Chicago Auto Show, head to our dedicated hub. The oft-delayed launch of the Volkswagen Arteon will soon be over. The big boss himself, Herbert Diess, chairman of the Volkswagen AG Board of Management, said the successor to the CC is coming to the U.S. this year, and that he is as anxious to get it to the market as anyone. Scott Keogh, CEO and president of Volkswagen Group of America, narrowed it down further: by this summer. VW needs to launch the Jetta GLI first, which is happening now, and the Arteon will follow in a few months. I presume due to the emissions scandal fall out, all new models coming to the United States are going to have some kind of delay. I almost forgot all about this cool looking car. I was at the VW dealer today and realized they didn’t have any on the lot. Then saw this article. Volkswagen just announced pricing for its long-awaited (and delayed) Arteon. Originally pegged for an on-sale date in mid-2018, Volkswagen says the liftback sedan is finally going to hit dealers in April. The starting price is $36,840 for the base SE front-wheel drive model and $38,640 for the all-wheel drive version after the $995 destination fee. Attractive styling and upmarket features are the main selling points for VW's newest sedan. It was supposed to replace the swoopy CC promptly, but that plan went out the window when the CC was discontinued after the 2017 model year and the Arteon was still nowhere in sight. The Arteon has been on sale in Germany since 2017, so the car in its current form is already a couple years old. Other markets get a choice of engines, but U.S.-bound Arteons will all be powered by VW's venerable 2.0-liter turbocharged four-cylinder. It's not short on power, pumping out 268 horses and 258 pound-feet of twist in this tune. Volkswagen pairs the engine to an eight-speed automatic transmission. Fuel economy numbers have popped up recently, and the front-wheel drive model is rated at 22 mpg city, 31 mpg highway and 25 mpg combined. The 4Motion all-wheel drive model dips down to 20/27/23 (city/highway/combined) mpg ratings. VW plans to offer the Arteon in three trim levels: SE, SEL and SEL Premium. All-wheel drive is available on every trim. The SEL starts at $40,990, which adds features like LED headlights, a panoramic sunroof, Nappa leather seats, ambient lighting, VW's Digital Cockpit instrument cluster and adaptive cruise control. Step up to the SEL Premium and you get 19-inch wheels, a heated steering wheel, massaging driver's seat and Dynaudio premium sound among other niceties. If you want a sportier appearance, the R-Line package is available with 19-inch wheels for $1,265, or with 20-inch wheels for $1,765. I averaged nearly 30 mpg on a 1300 mile road trip this week in my loaded up 4Motion 3 row Tiguan. Lots of mountain passes. I’m fairly confident this thing would easily best my numbers even with the higher state of tune. Both have the 8AT.